The CEO’s span of control has roughly doubled over the past twenty years, from almost 5 to just under 10. Two immediate questions come to mind: Why? And is this making CEOs more—or less—effective? The short answers: First, it’s happening because expectations for CEOs have risen and, counter to many reports, so has their capacity. Second, the relationship between top team size and effectiveness depends, mostly on a CEO’s stage of tenure. The long-term rise in CEOs’ span of control is the result of several factors. Rising expectations from board members and other governance changes over the past decade have put pressure on CEOs to get closer to the business, take on more positions directly, and not work through intermediaries. Indeed, in our annual study of succession trends among CEOs (published since 2000), we have seen newly appointed CEOs asked with increasing frequency to focus tightly on the business. More and more often, someone other than a new CEO is the chairman: In 2000 just over half of incoming CEOs in North America held both titles, a figure that fell to 10 percent in 2010. Separating the Chairman and the CEO positions often means that CEOs have more time for the business, as intended, though the CEO’s relationship with the chairman can become time-consuming in itself if it’s difficult. Nonetheless, and in parallel, fewer CEOs are naming COOs except when they’re setting up their own succession. With all that going on, where are CEOs getting more time? The most significant enabler is technology. Basics like voicemail and e-mail have made communications simpler and more efficient. Video means less travel. And improvements in customized performance dashboards have helped CEOs understand their companies more deeply and faster. All this gives CEOs the ability to spend one-on-one time with more direct reports not on the basics, but on topics like tough people decisions or operational issues. The second question is whether this is a good thing or not—are CEOs able to do more for their companies in this situation? Some CEOs are troubled. Many have an idea of how many direct reports they should have—often seven, for reasons I don’t understand. In my experience, seven is very frequently too few yet, in some cases, too many. There’s a better way to think about it. Look at Sara Mathew, who became the chairman and CEO of Dun & Bradstreet in January 2010. She didn’t replace herself as COO, so on top of the six people who had reported to her predecessor, she tacked on the 10 who made up her previous team, giving herself 16 direct reports. She had a number of reasons, including wanting to stay on top of what was happening across the organization; she gave herself a direct view into aspects of the business that earlier CEOs were willing to delegate. Such an approach is very often the right one to take in a CEO’s first year to eighteen months. Other reasons to have a large team in this phase are to evaluate talent and to ensure exposure to a wide range of views while shaping a new direction. The best CEOs use this period to understand how to realign the members of the team relative to where the company is headed; ultimately, as they enter a “steady state” period of tenure, they reduce the number of their direct reports. Mathew, for example, gave up direct responsibility for roles and functions that were fairly mature or self-sustaining and elevated new strategic priorities, especially marketing and innovation. Today, she has seven direct reports, a number she describes as “comfortable.” We typically see CEO spans drop back to five or six as they prepare for succession. They do this by asking one, two, or three leaders to take on substantial P&L roles as part of the assessment process for choosing a new CEO. 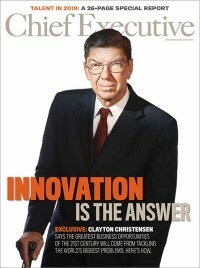 In addition to their tenure as CEO and whether they are also chairman, we advise CEOs considering the right size and composition of their team to think about the degree of cross-organization collaboration required and activities that take significant time beyond their direct span (such as interacting directly with customers or regulators). In the end, while CEOs have the time to manage a larger top team, they should only do so when they know it’s bringing direct benefits to the business. The fact that average span has risen may have something to do with the fact that turnover among CEOs has risen, so more and more are early in their tenure, when large teams do indeed make them more effective. The best CEOs are attentive to the ever-evolving demands of the job and continually adjust their teams as they go. This article refers to findings detailed in the current HBR article “How Many Direct Reports?” which draws on Harvard Business School professor Julie Wulf’s large panel data analysis and Gary Neilson’s 32 years of consulting experience with Booz & Company. The CEO example cited here article came from their interviews with current CEOs. Gary L. Neilson is a senior partner in the Chicago office of Booz & Company.